Gift Vouchers are an ideal gift experience. With a fantastic programme of shows throughout the year at the Caird Hall and Whitehall Theatre and recipients are spoilt for choice. • Valid for 12 months. 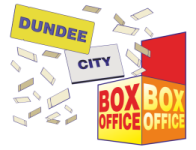 • Valid for performance tickets only for the specific venue purchased – Caird Hall or Whitehall Theatre – not transferable. • Online purchases are subject to £2.00 secure delivery fee. • Gift vouchers cannot be accepted as payment for food, drinks, programmes or other merchandise.